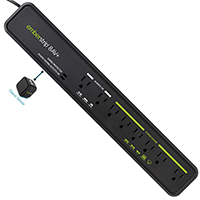 The Embertec Classic 8 Outlet Tier 2 Smart Power Strip not only safeguards your equipment from damaging power transients, it helps lower your electric bill. This 8 outlet model offers 2 always-on outlets for devices that you do not want turning off automatically, and 6 controlled outlets (that are controlled by the master outlet). The Classic Smart Power Strip eliminates what is known as a vampire load, reducing energy usage and costs. Embertec has tested the power strip in real homes and businesses to meet the highest global standards. It's easy to install, and works with many types of AV equipment. It’s important to note that this Tier 2 Power Strip is an advanced model (APS) that does not feature the simple design that Tier 1 has. In addition to saving energy, Tier 2 APS use programming and computation to properly monitor, interpret, and control AV equipment.